If you are visiting my blog from Pinterest, Welcome! 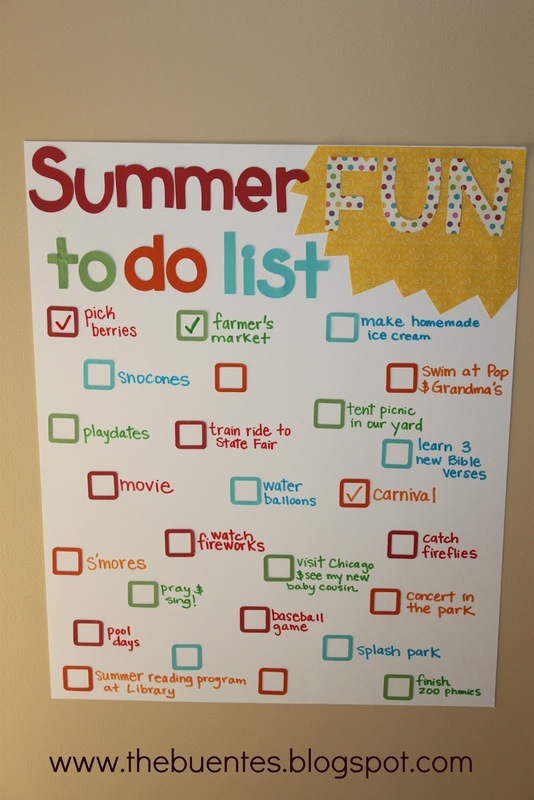 I have had such a great response to our summer fun list and I'm flattered! Last year I remember seeing one of these summer to do lists somewhere out there in blog world, and I knew I wanted to recreate it this year. I've seen lots of cute ones on pinterest too! I just cut out the letters on the cricut and then cut out some "check boxes" too. After hot gluing these to a poster board, I wrote in the different activities we will be doing and left a few blank for spontaneous fun! So far, we have checked three off the list! Look out summer, here we come! Hmm, what should we do next? What is on your summer to-do list? Great idea! I am always promising my boys the moon but there is no accountability for them to pin me down! FABULOUS! This is a great idea!! You should bump this up for this summer! I just saw this on Pinterest and we're definitely doing this this summer. Thank you so much for sharing this! I just became a follower of your blog. This is a great idea since my daughter has all kinds of plans for the summer that we can list and check off. We are a family of check lists! I love this idea! I'm doing it with my kids this summer! Thank You for sharing, Love the idea!!! Easy to personalize for our family. Thanks for sharing the great idea! I love this idea. The things you've already got on your list are a great starting point for parents with children of any age! I would love to take my 14 year old son back to basics! I know you posted this 3 years ago, but I'm definitely doing this with my kids this summer! Thanks for the idea!